First thing to notice is that GOLDEN acrylics do not have an expiration date. There is no definitive shelf life, meaning if they are stored well, they should not go bad or change and should remain viable for many, many years. We recommend storing the paints in their original containers between 60 – 75 degrees and it is best if they do not experience large temperature fluctuations. Remove dried or wet paint from the threads of the jar and lid. 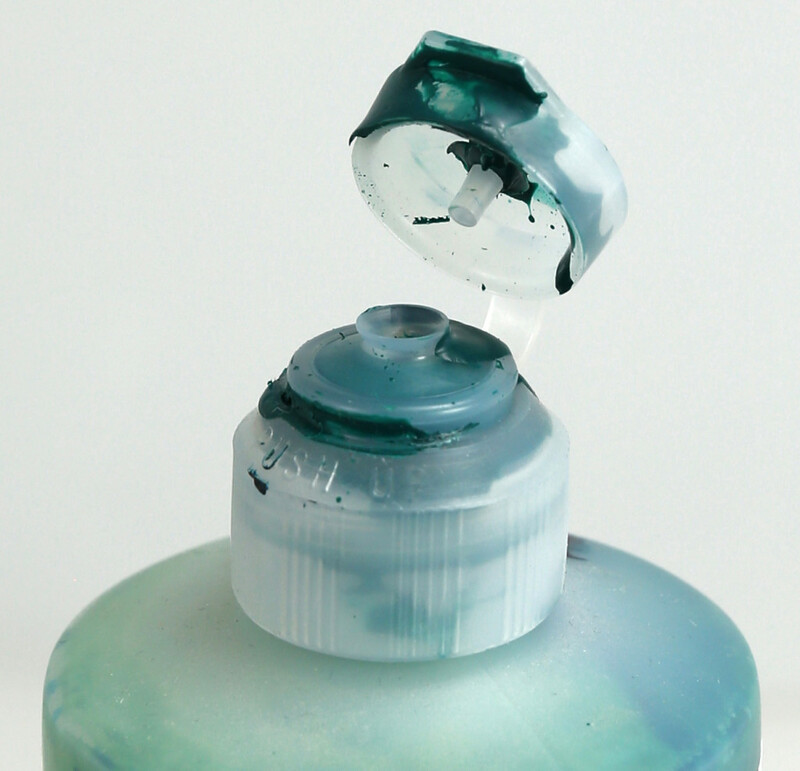 For air tight closure, remove dried and wet paint from the inside and outside of the bottom and top of the cap. 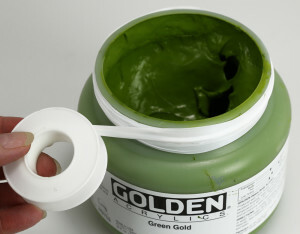 It is important to keep the threads on the mouths of paint tubes, jars and bottles, as well as from the caps and lids clean, in order to maintain an airtight seal. Make sure to wipe the threads clean before replacing caps and storing paints. Acrylics dry through water evaporation, so if the water is kept in and the air out, it should keep the paint useable. Our jars are made of HDPE (High Density Polyethylene) plastic, which is a great moisture barrier and the liners in the lids also help to keep the products fresh. If there is any separation of clear or milky fluid on top of the paints upon opening, simply stir the liquid back into the paint until you have a homogenous mixture. Do not pour off the liquid, these are important elements of the composition and should be mixed back into the paint. If the paint or mediums have thickened, it may be possible to loosen them up by adding some GAC 100. Add in small increments and stir until the consistency is similar to fresh paint or mediums. A little distilled water could also be added to help bring the paint back to its original consistency. If there is a need to store paints and mediums that have been thinned with water, we recommend using distilled water for the thinning, as tap water can sometimes cause mold growth. Acrylics thinned with a lot of water will often cause crashing of solids that cannot be remixed or overwhelm the preservative in the paint and also cause the paints to begin to smell and grow mold. Polyethylene plastic sheeting circles cut to the diameter of the inside of containers. Polyethylene circles sitting on top of paint. 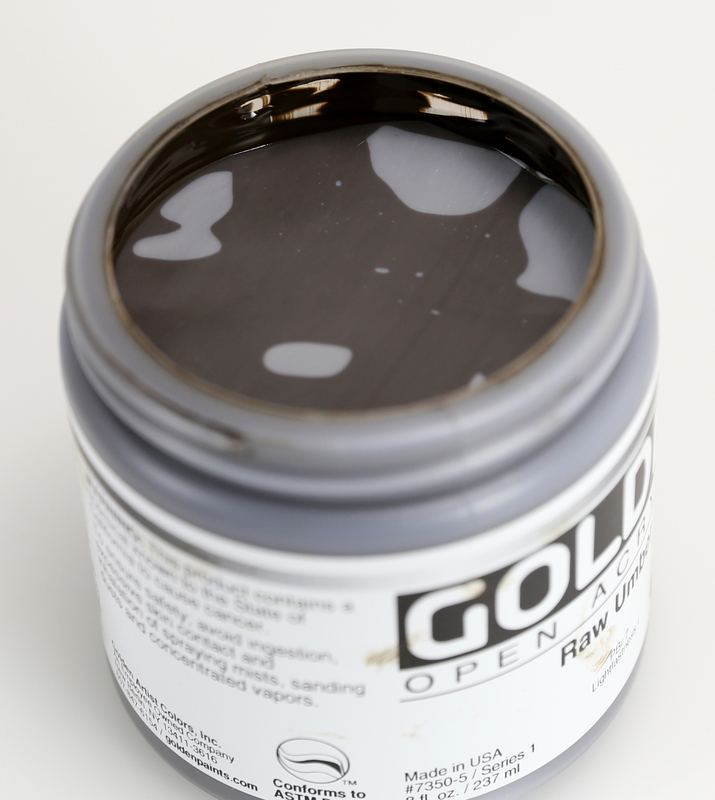 As the products are being used and the amount of paint, gels or pastes from the jars is being depleted, it may be possible that the large amount of air trapped inside or “head space” could cause the product to dry out. 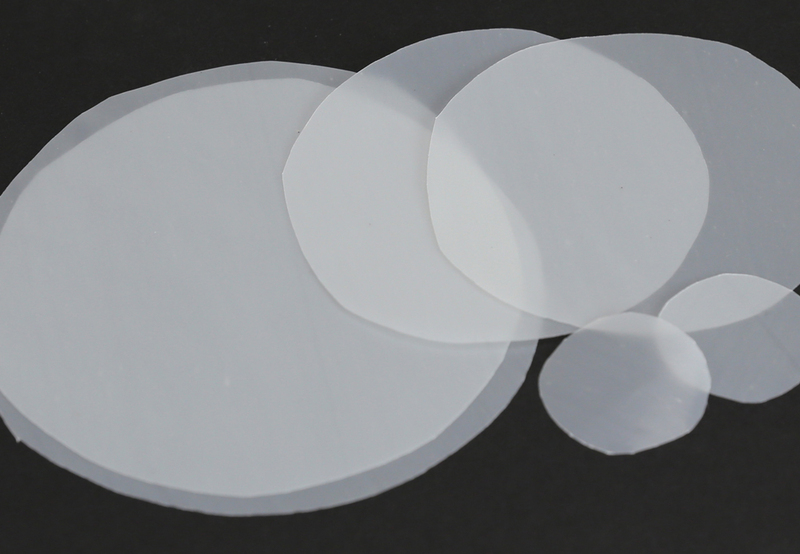 You could transfer the material into a smaller airtight container or the drying could be inhibited by using a circle cut from polyethylene plastic sheeting that is the diameter of the inside of the jar and laying the circle directly down upon the paint, then closing the lid. This will reduce the “head space” and block oxygen from getting to the paint to dry it out. If the threads of the tube, bottle or jar seem very dirty and you cannot clean it completely, plumber’s Teflon tape could be used along the threads to help create an airtight seal. Plumber’s pipe tape wrapped around jar threads. what an excellent article ! The cap shown, is that new? is it for acrylic paint tubes? We are so glad you like the article! Thank you. The only caps that are shown are the lids for the jars of Heavy Body paints and the older flip cap for the Fluid Acrylics. Unfortunately, that cap would not fit on a tube. Thank you very much for some great tips on shelf life! I’m wondering if you can give us an article like this on the best way to look after tubes of acrylic paint please. I use my paints almost every day all through the year. It isnt easy to keep the metal screw area clear of paint and so can this also be covered with that thin plumbers tape? Perhaps you have other helpful ideas? Also I have one tube of paint that has thickened and I am wondering why? Clearly you couldnt add anything to the tube to thin this. If I manage to squeeze some out and then mix in some medium it tends to look a little grainy and takes quite some mixing to get to a smooth even look. it around the metal screw area & that works quite well!! Excellent with gesso bottles or jars as well! We know it can be difficult to be concerned with keeping the threads of the tubes clear while in the midst of painting, but if you tried to make sure to wipe the threads right after squeezing the paint from the tube and from the inside of the cap, the cap will be easier to replace and make a tighter seal. The teflon tape should help to make a tighter seal if your threads already have dried paint that you cannot remove. If the seal is not tight, the paint may start to thicken from slowly drying out. You could consider transferring the paint from the tube into an airtight container if this starts to happen and adding a little GAC 100 very slowly and some distilled water could soften it back up. The key is not to add the medium or water all at once, but to very slowly add drops until you get the consistency you are looking for. If you add too much at once, it could feel clumpy and take a longer time to mix smooth. If you use larger quantities of paint, you might consider buying the paint in jars instead of tubes, which may be easier for you. If you would like to discuss further or have any other questions, please feel free to contact us at help@goldenpaints.com. I’ve had major problems storing acrylics mixed with water, especially in warm weather so I try to just mix what I’ll need for the next few days. Awesome article BTW! It is also possible to contaminate the paint with a brush if you are putting it directly into the container of paint. I have also heard that using vasoline on the threads can help keep them clear, but I don’t know what that does to the seal and I suspect you would need to take caution about getting it in the paint. Putting petroleum jelly on the threads makes us nervous, as it could cause adhesion failure of the paint if it was accidentally applied to a painting or under a painted layer. This failure could occur even with a very thin layer. I’ve been painting with Golden for over fifteen years. I have never had a problem with it drying out. Colors I use less of I buy in smaller containers. I love this paint! Thanks for the info! One of the few acrylic tubes that have hardened on me was Mars Black from a competitor. This went almost completely solid. A quart bottle of Titanium White from another competitor was recently emptied some 40 years after purchase. I have had no issues with Golden products since becoming acquainted with them about five years ago. Thanks for the info. I will check out your site. I agree! There are “lesser” brands with caps that seem to stay on. I was recently at an art workshop where we used only Golden and a common complaint was the darned caps. Hi Annie, We take this kind of feedback very seriously and are looking into better options for caps. Thank you for making us aware of the issues that you and others have experienced. We view it as a gift when people share any difficulty they may be experiencing with our products. If you would like to discuss this further, please feel free to email us at help@goldenpaints.com. Thank you for sharing your feelings. We are always striving for new and improved caps and paint storage systems and we keep a lookout for new developments. We really appreciate your feedback. Thank you! I was told to store acrylic pots upside down. Good idea? We think the theory is that if the product is flush against the top of the lid because it is upside down, then it would be more difficult for air to get into the jar. If the lid is clean and on tightly and the product is in a good environment, whether it is stored right side up or upside down, the paint really should remain usable for many, many years. This is great news since I am hoarding my all time favorite color, Cobalt Teal, which was discontinued a few years ago. I have found this to be true. Golden paints last years if, for some reason, they sit that long. Love the plumbers tape tip. Thanks for making such a high quality product! Thank you for this very useful article. You mention polyethylene plastic sheeting to help reduce “head space” in jars. Could this be done with polyester or polypropylene sheets as well or is there specific chemical properties that make the polyethylene the best choice? We recommend polyethylene plastic because the acrylics will not adhere permanently. Polypropylene may also work, as acrylics have poor adhesion to that plastic as well. Acrylics could adhere permanently to polyester, so likely would not be a good choice here. We hope this is helpful. I’m saving my $ to buy the Golden paints and I can’t wait to use them. I’ve heard so many good things about them. Thanks for the information. I really like you guys, and love the products. I have Golden paints kicking around from well over 15 years ago, still as good as new. I think I have your first run of fluid acrylics, actually. They are seemingly immortal as long as you keep good hygiene and don’t let bacteria into the pots. That’s great to hear and great advice. The acrylic paints contain biocides as a preservative, but sometimes if tap water gets introduced into the paint, mold can grow. If you are storing water thinned paint, we would recommend thinning with distilled water. Great article. BTW…I just recently started painting but had about 2 dozen tubes of paints from another brand from 35 years ago. Some opened, some not. They were perfectly good. The tubes were plastic. So the shelf life is long. But I also started using Golden paints and love them so much better, so it looks like the 35 year old paints will probably sit for another 35 years…lol. Thank you Pat! We are so glad you love the paints! Thanks for this info. I usually place plastic wrap on the tube or jar and then replace the cap. It really helps to make the lids easier to take on and off. But using teflon tape seems like an easier solution. BTW, this may be a silly question, but can I get the polyethylene sheeting at a hardware store? You can get the polyethylene sheeting at a hardware store or home center. It is usually just called “plastic sheeting” and can be found in the building materials department. Is is the same material used for paint drop cloths, but in a thicker gauge and is usually used as a vapor barrier when building walls. Stacey, I’ve found that a drop of glycerin inside the lid helps get a tight fit, cuts through buildup, and helps keep it clean. I also use just a touch of glycerin on my brushes after a thorough cleaning for conditioning. The trick is to use just a tiny amount. Glycerin is a non-volatile humectant, which means it does not evaporate. If mixed with the paint, it could lead to permanently moisture sensitive or sticky films. We would recommend washing brushes before use if conditioned with Glycerin and to take care to limit the amount on threads. We hope this is helpful and if you should have any further questions, feel free to email us at help@goldenpaints.com. I want to make an outdoor sign using th indoor acrylic…. How do I protect painting when finished? I’ve had a collection of Golden brand paints in the 4 oz. tubes, probably a dozen of them, since I took art classes in college back in 2005. I recently pulled these back out of the closet to see if they were still usable, and much to my surprise they still are! and work perfectly. Thanks for sharing your experience Tyler! Thank you Jennifer. Glad we could help!